It's always great fun to have an escape weekend with girlfriends for a play day. 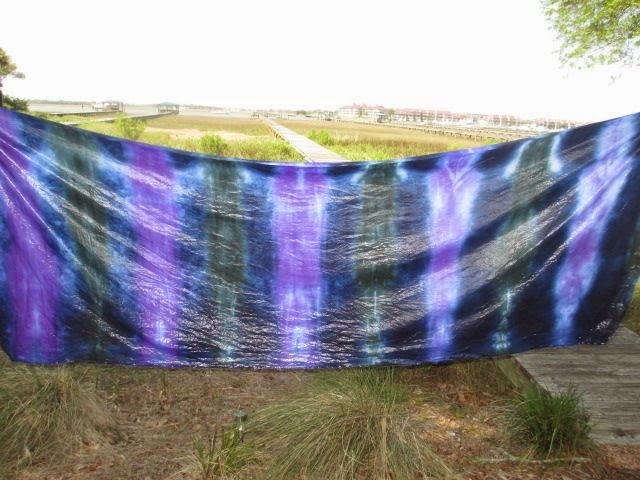 This little adventure involved dyeing fabric using numerous techniques. 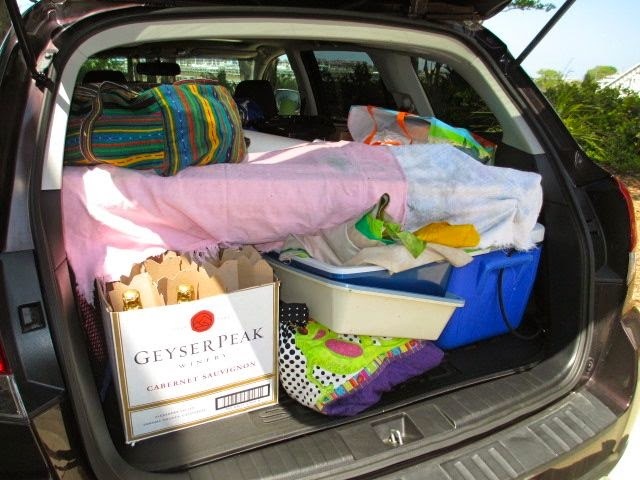 Our car was packed to the brim, couldn't fit a bobbin pin in, we were off and running(or riding). 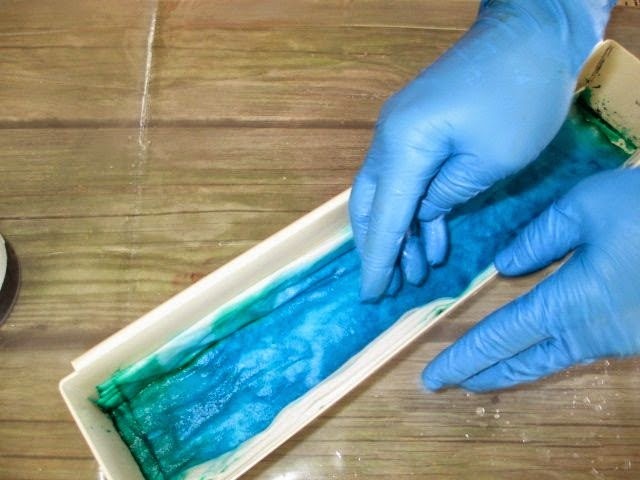 One of the first techniques we were to do was tray dyeing using pleated fabric. 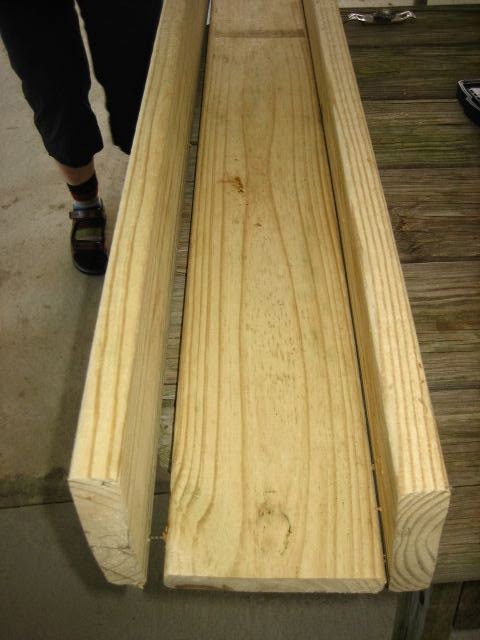 We had to construct a 3 sided tray which we did using 1 x 6" boards. 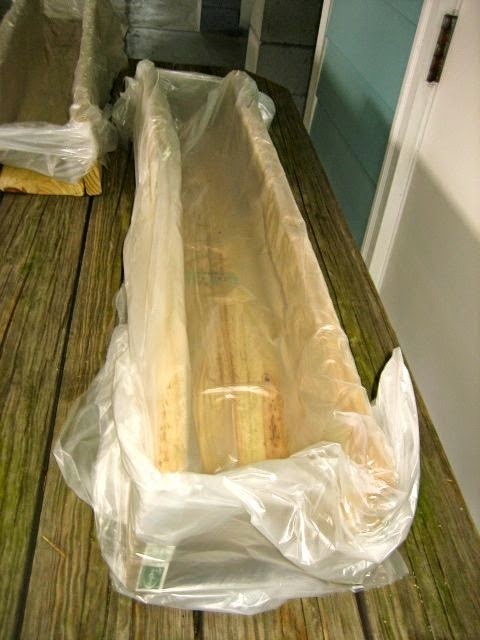 Some of the boards were warped but it didn't matter as they were lined with plastic. 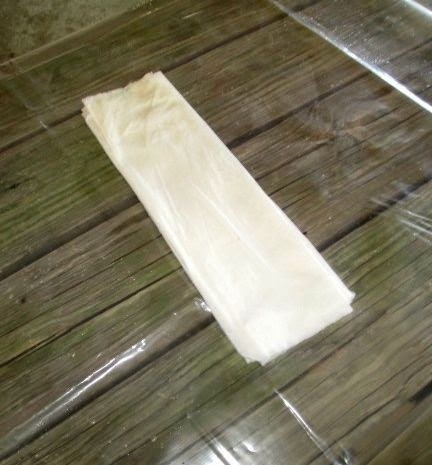 The plastic was used to make "end" pieces and wrapped around the sides and held in place with a staple. 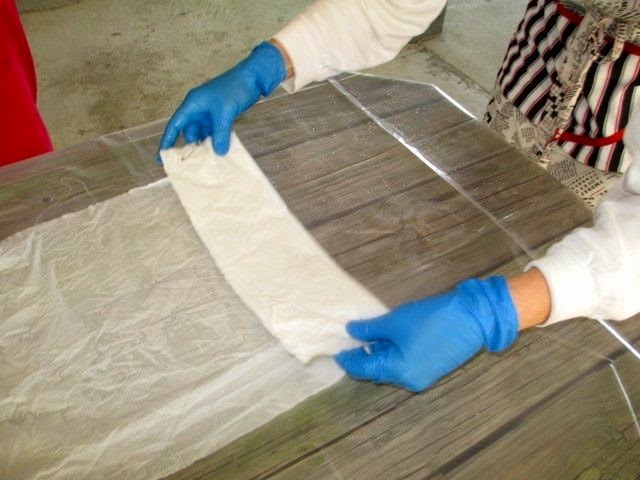 Next we had to fold our fabric accordian style, making it a little wider than the width of the tray. This was done so the sides of the fabric would come up a little on each side. It was easier when 2 people lowered the fabric into the tray. We had 2 big trays and 1 little tray. 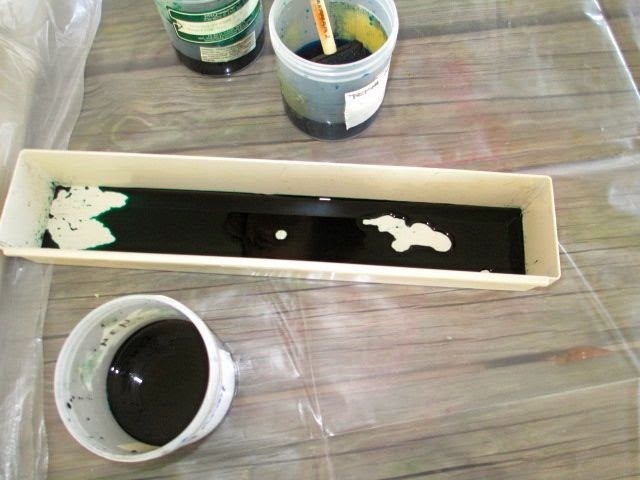 Dye solution was poured into the bottom...just enough to cover the tray. and a little squishing to help the dye penetrate. You can see on this bigger tray, after the middle color was laid on the bottom, the tray was tilted so a second color could be laid in the "crook" of the tray. 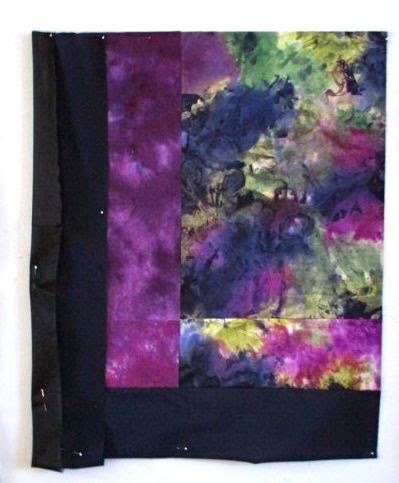 The fabric was temporarily lifted up slightly to do this...then laid down on the second color. 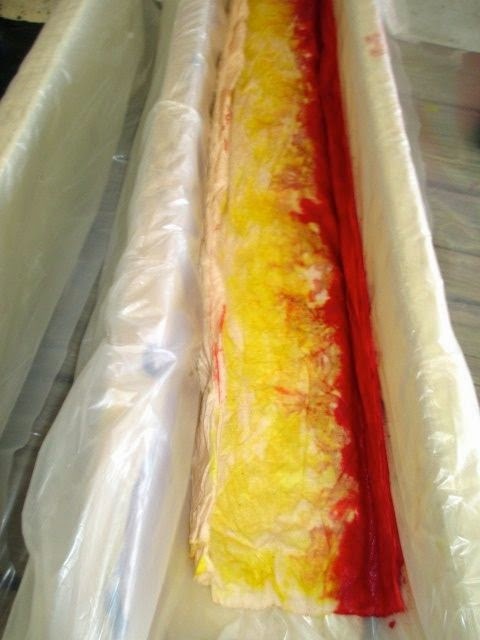 You can see the wicking of the red into the yellow. On the other side, we did the same thing. You have to be conscious of what colors you'll get when they melt together, sometimes hard to do when you're excited and caught up in the process. Kate did 2 pieces and this is her second piece....beautiful! I did just the one piece and decided at the last minute to add the Robins Egg blue which it so needed. We did many other things and I'll have lots to show and share in the next couple of days. 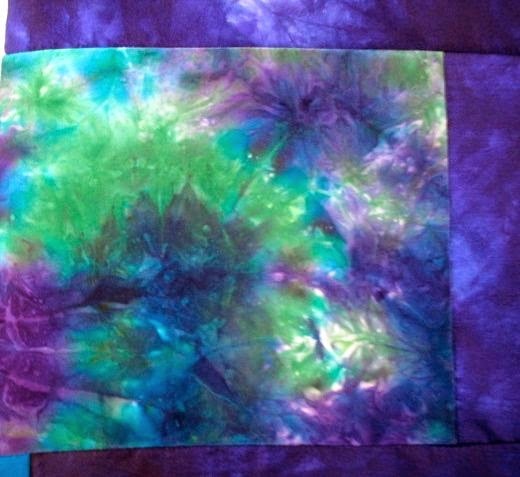 I have always loved working with silk and especially love the colors you get when dyeing it. 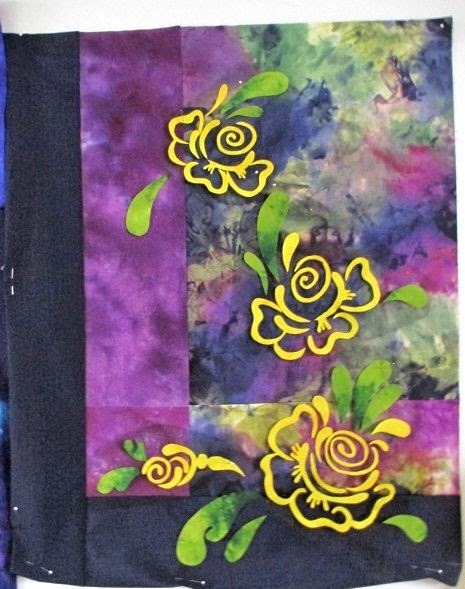 I have lots of silk scraps but never think to use them in a quilt. While cleaning out, I came across some larger pieces and decided to give it a try. I have some multi-colored and fortunately the right solids to go with them. This is the first one I'm working on. This is another I've pieced together and will tackle at another time. You can see how pretty and multi-colored some of the areas are, but also very busy so I'll have to choose wisely with what I put on top. 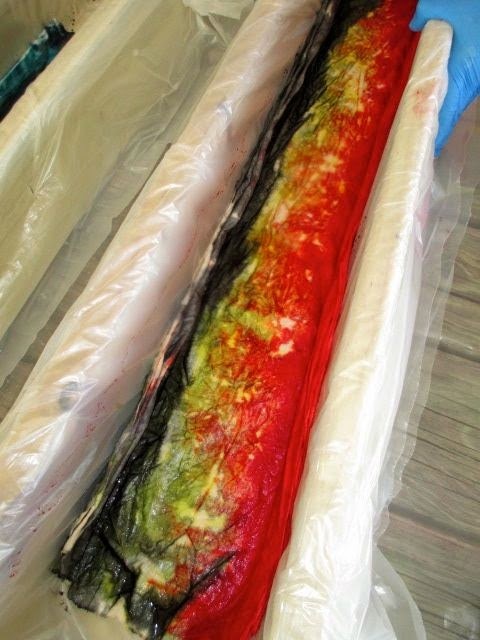 I'm using several different kinds of silk - China, charmeuse and crepe du Chine. All are slippery and a challenge to work with. 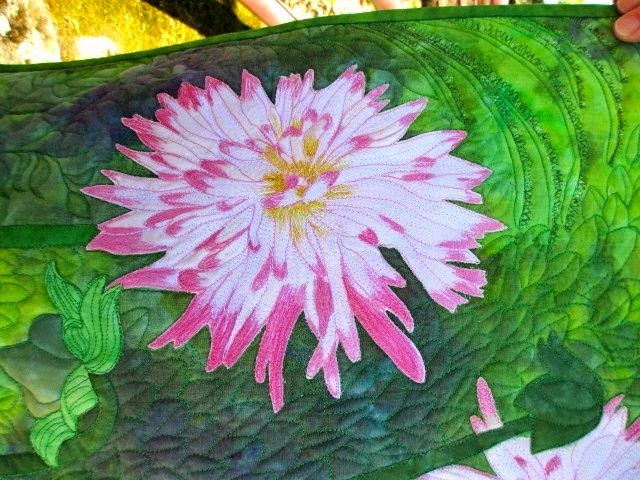 I find by treating the back with a fusible knit interfacing such as French Fuse, the fabric is more stable and easier to work with. 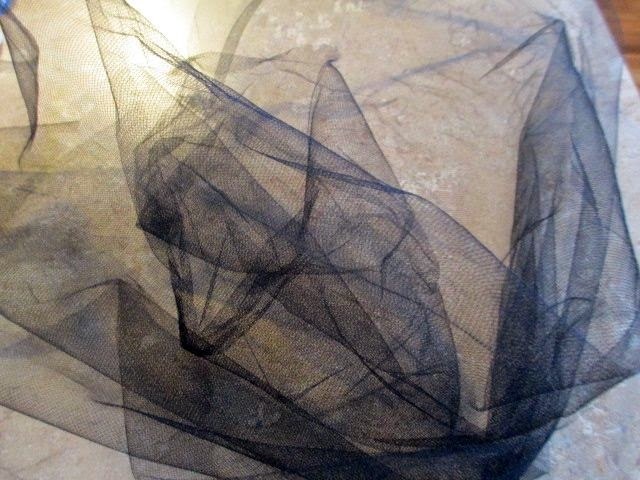 I'm using a design which has lots of little pieces so I'm using a black tulle to work on top of. 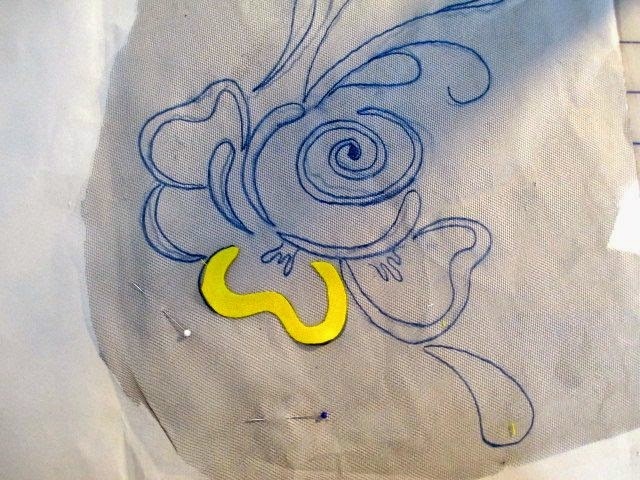 I've drawn the design on paper and laid the tulle over it. As I cut out each little piece, I lay it down in its corresponding area. 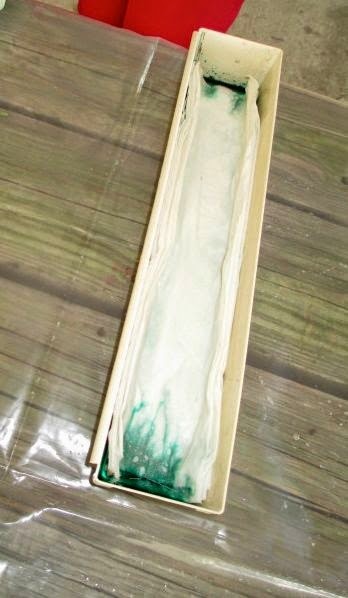 I use a touch of glue from a glue stick to hold it in place. 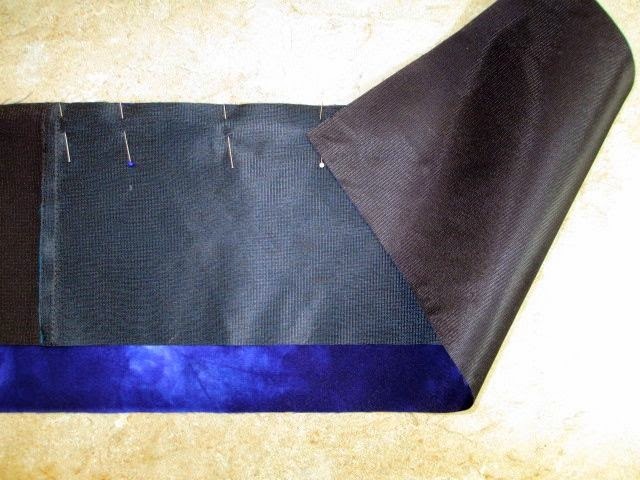 I can now pick up the tulle with the design on top and move it to my silk for placement. The tulle is hardly noticeable so you get a good feel of where to place the design. 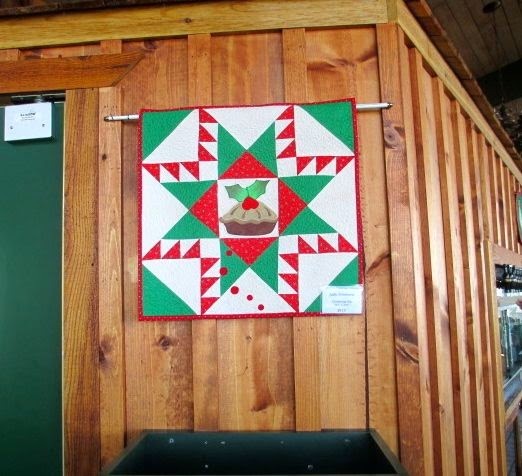 Our PTA group has been enhibiting quilts at the Pisgah Inn for several years now. The Pisgah Inn is a beautiful hotel and restaurant high up on the Blue Ridge Parkway. Because the parkway is a high elevation, it is subject to slippery roads during winter. The Inn closes from end of Oct until the end of March. 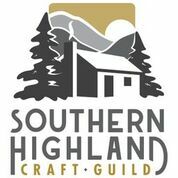 Last week was the grand opening and we once again had the wonderful opportunity to display and sell our work. It's a win, win for everyone. The restaurant gets a percentage and a beautiful display for patrons to see while eating. 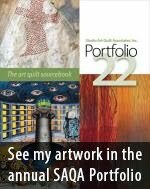 We have the chance to display and sell our work. 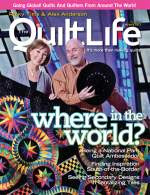 We all decided to go to lunch yesterday to see our quilts and eat some yummy food. 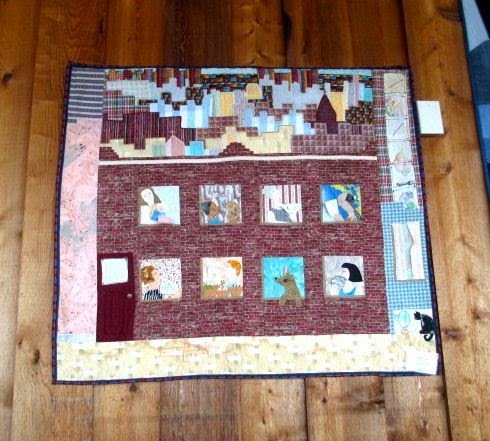 This a quilt I made many years ago but rarely used - not the kind of quilts I make nowadays, but it was fun to see the progression in style. 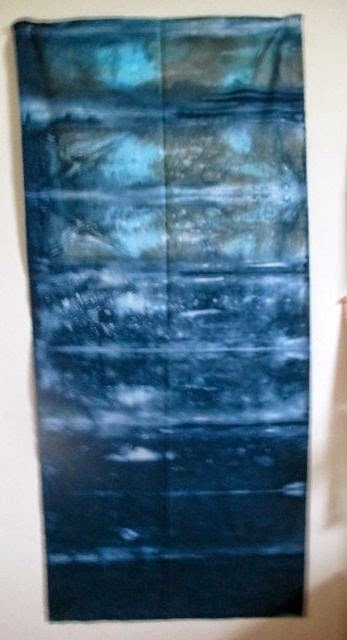 This is the piece I did for an international exhibit called The Everchanging River which featured 33 pieces all connected by the same river fabric and within the parameters of certain dimensions. It has traveled all over the world as part of this exhibit, the last stop being Thaiwan. Now it's time for it to find a permanent home. 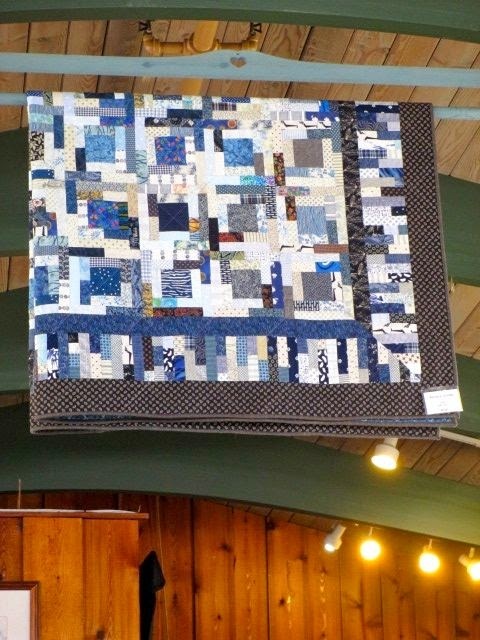 This is a small piece that Dort created and it fits perfectly in a new section they've added to the restaurant. another Dort I think - very clever! This is a piece by Linda C - very colorful and graphic. 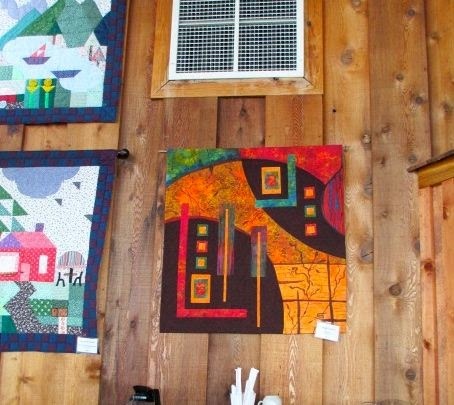 Georgia B has a pair of quilts that are featured together. And a Kate piece in the foreground and Mary's yellow and black piece right behind it. They both looked great hanging from the rods. being able to see back and front. 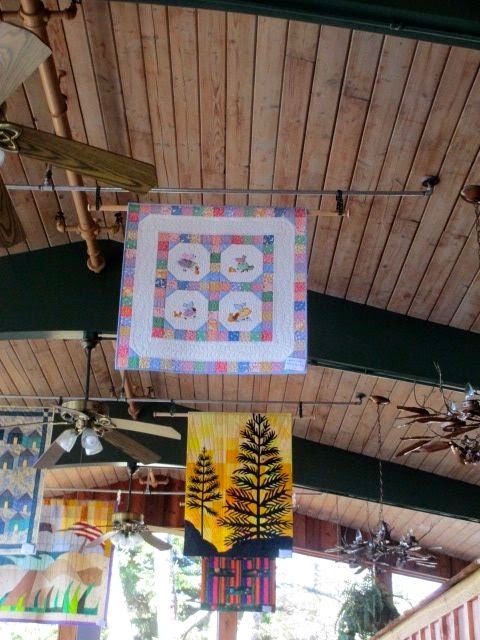 Last year, the Pisgah Inn installed the ceiling rods just for us and our quilts giving us more room for dispaly. 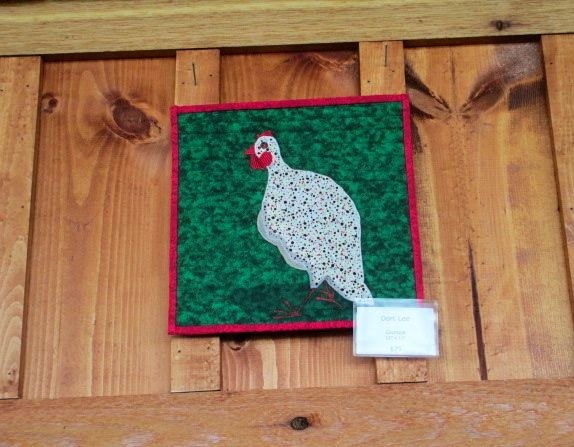 This is a piece that Lynne H created. 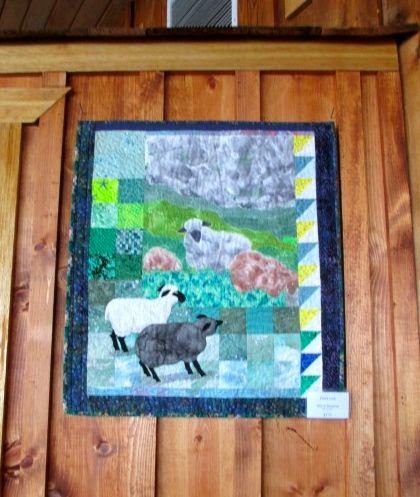 We even have quilts in the gift shop, this is by Barbara Swinea. We had to have our Show and Tell outside which was a beautiful day. Connie is holding up Kate's piece for me to photograph. Kate loves green and mixes a lot of different greens in the same piece. The flowers on this piece are beautiful. Kate used inktense pencils made by Derwent to create the effect. They are similar to Derwent's watercolor pencils except these are permanent and very good for fabric. I'm thinking I need to order some of these. 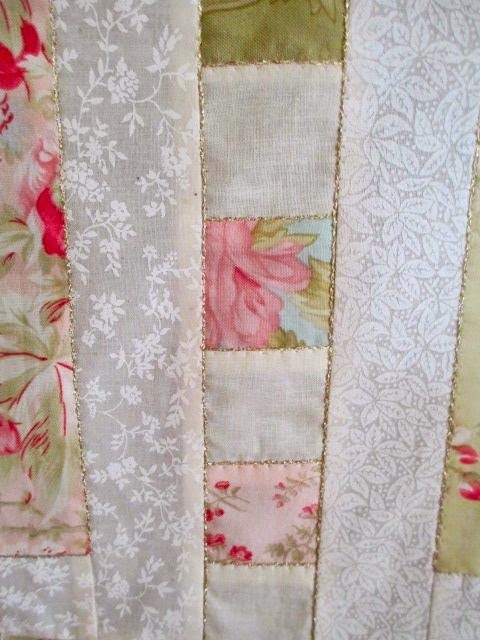 I've had these fabrics in my closet for a while, actually forgot about them when a friend reminded me how nicely they would work in the retreat project we were planning. I needed a few more in this Moda series and she just happened to have some to add - thanks Kate. 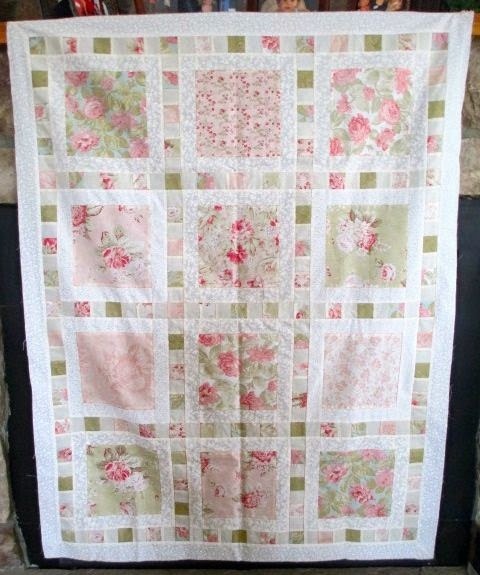 They are very soft, pretty colors and I've always loved pink and green so I was off and running with the idea. 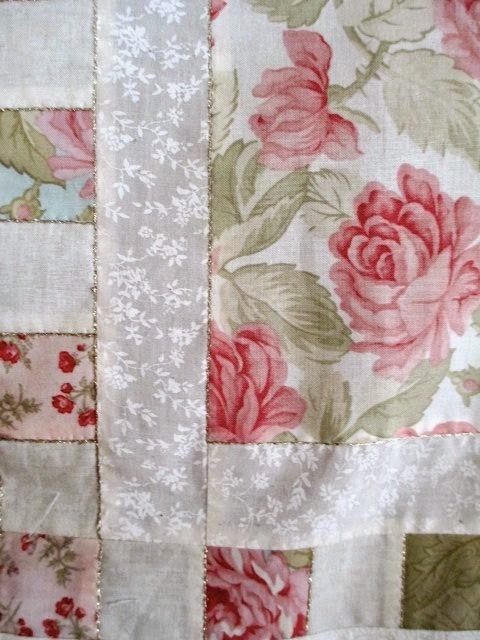 I am not a piecer, and no matter how hard I try, I just can't get things to line up. 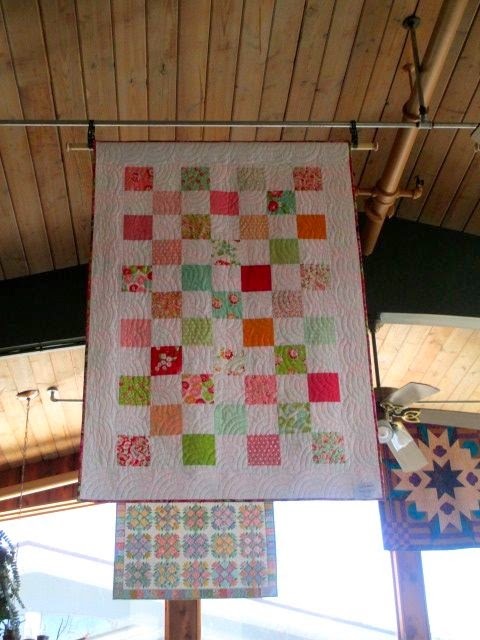 This quilt was hard for a non-piecer. Would I do it again....Yes, because I love the way the fabrics worked in this pattern - Mary Kay 5. Because the colors are so soft, I thought it needed a little something to sparkle it up. 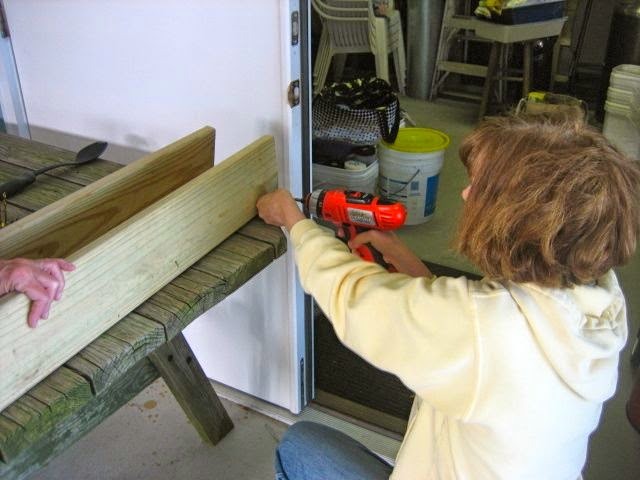 I thought of couching - a technique I really like to do. 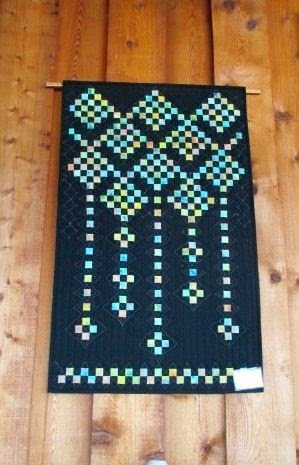 I decided to couch around the little squares and long strips AND also the main blocks in the center. It was very tedious and time consuming, but once started, I had to see it through. I really liked the results. This is Candlelight by YLI and a very soft couching thread. 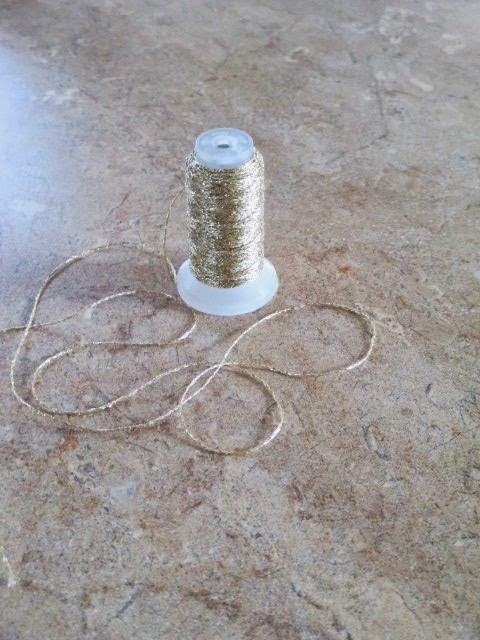 You can't run it through the top of your machine; you have to use it in the bobbin or couch it on top using a monofilament which is what I did. 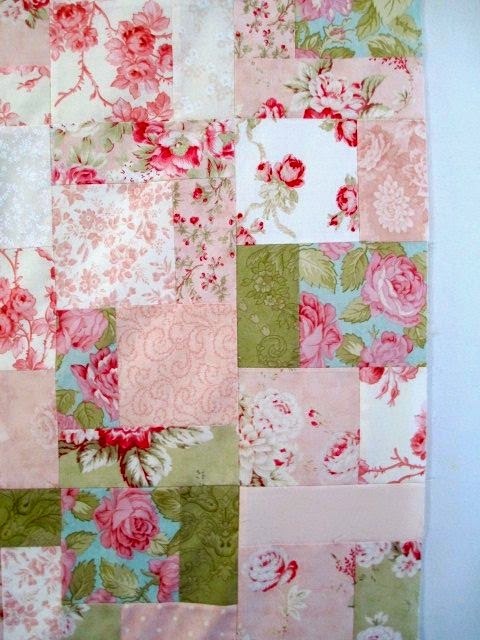 I still had lots of this fabric left over and too pretty to piece together for a backing, so I made an "I Spy" quilt. 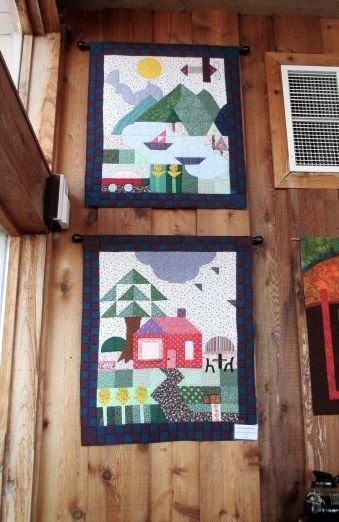 It's the same pattern I used on many children's quilts only this used the Moda. I like this one better than the first and a whole lot easier. 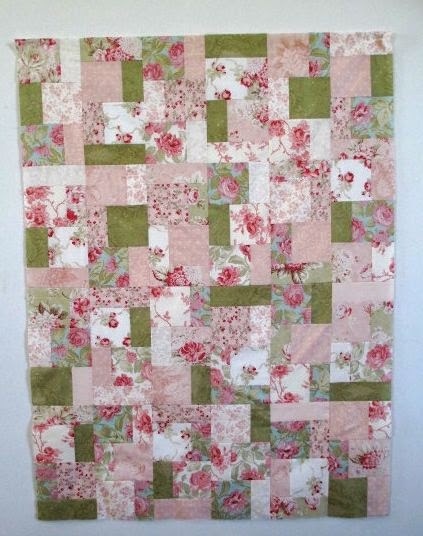 There is a tutorial for this quilt on my blog under "I Spy" quilts. 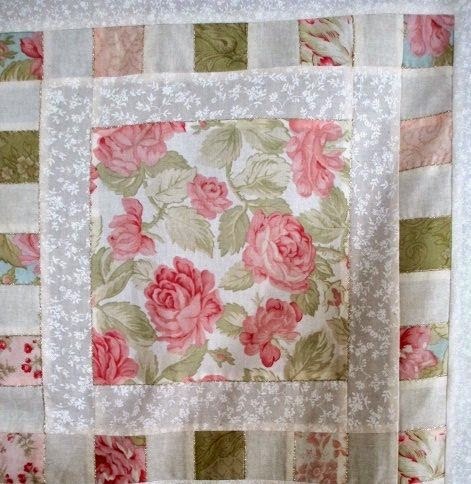 And yes, still more fabric, so I did this little pieced quilt and it is small. All 3 will find different homes. And do I have any more of this fabric?.. 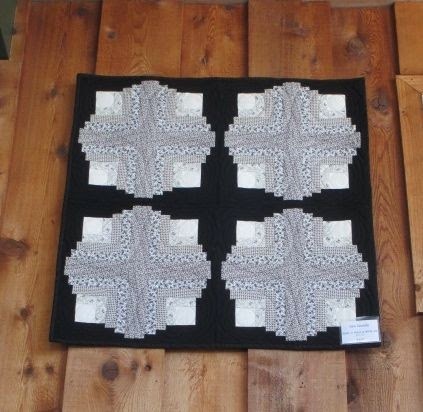 - you might ask...yes and I thought maybe some pillows for the bedroom one of these quilts will be in. I sometimes feel this fabric has some myserious powers like in the movie The Gremlins - they always multiply after midnight. I might have to spend a night in my closet to find out. 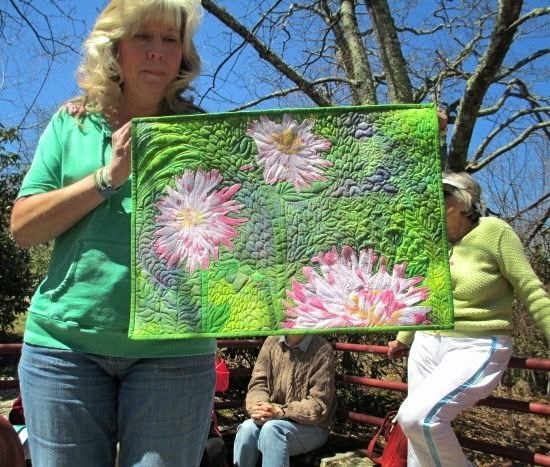 I taught a workshop for the Asheville Quilt Guild a couple of weeks back. 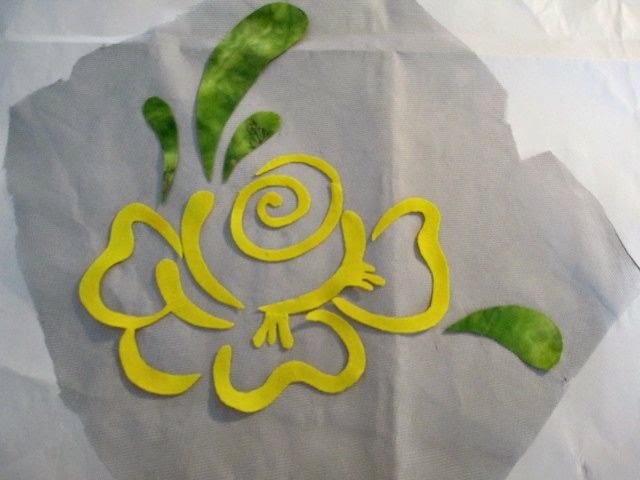 It's one of my favorite workshops; it involves working with layers - a top layer of sheer organza and bottom layer of cotton also silk screens, paint, appliques etc. The best part for me is working with students while they design their pieces, sometimes a little hesitant working outside of their comfort zone but always with the best results. 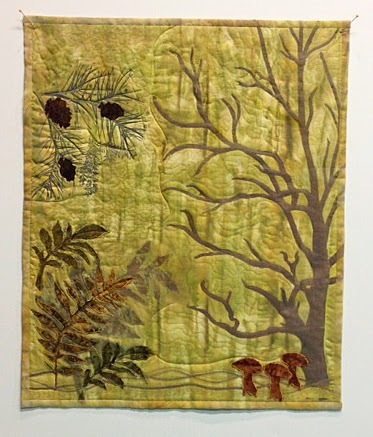 This wonderful piece was created by Meredith Brooks and titled "Sunshine on the Forest Floor". She wanted to create a look that suggested leaves scattered in the forest, some leaves more prominent and some hidden. Using the sheer layer helps to achieve that effect with leaves on top and underneath the sheer. I think she did a wonderful job and I love her piece. Marene Parsons created this next piece, equally as wonderful and very different. She calls it "Golden Woodlands". There is a really nice balance between the elements she used on top (mushrooms, acorns and some ferns) and the big tree and pine boughs underneath. 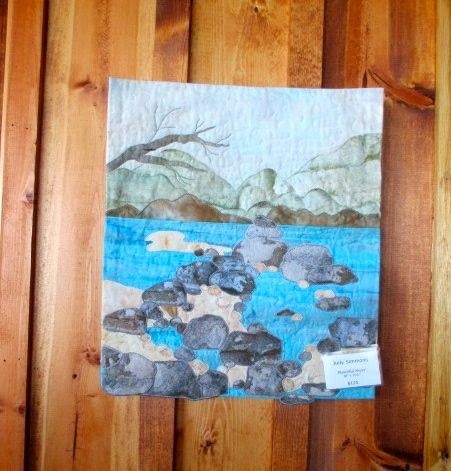 Marene used some of her couching skills to create a forest floor with couching threads - a nice touch and a lovely piece. This next piece is from Mona who took my workshop in Charlottesville, VA last fall. It's called Misty Morning. 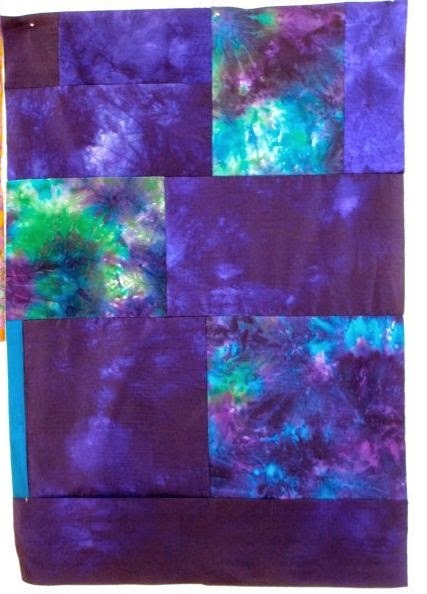 She uses some beautiful colors in her background and very lively colors on top of the organza. She finished her piece early on and sent me a picture. I waited to group it with other works from this workshop. 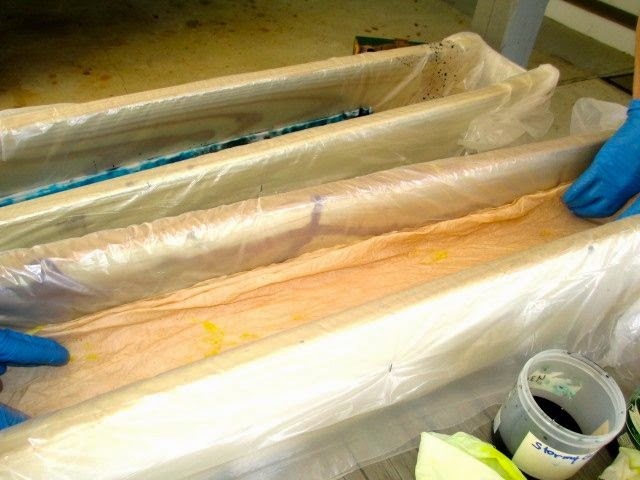 In the workshop we did with Mona's guild, we painted the organza but also added another step of sprinkling salt on top. Salt draws the liquid towards itself to create movement lines - a great effect. But it does add another step as you have to heat set, rinse off the salt and let dry again. I was helping a lot of students with the process, brushing off salt, heat setting but for whatever reason overlooked rinsing this particular piece. Mona emailed me to say there were droplets of water on top of her finished piece...wow...where did that come from...and finally realized it was the residue of salt - very undetectable, that created the moisture. A good hint to pass on, if working with salt, to make sure and rinse. 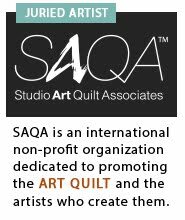 As I mentioned before, this is at the top of my list of favorite workshops to teach: I'll be teaching this at the NC Symposium in May and the Quilt Symposium of Alabama in June. 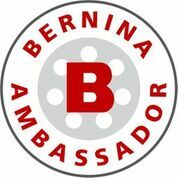 Check out my blog for my schedule..